As a photographer of 40 years experience who recently has made the move into video making, I have read more than my fair share of books/blogs about video making over the last couple of years. This book fills in all the gaps and more! A great book, couldn’t put it down. There’s a lot of information that you just don’t get easily anywhere else. It’s more a ‘why and how’ kind of mental approach to making videos rather than a technical one, but there is some technical information in there if you’re new to photography or video. Even if you are a newbie and want to learn lot of technical stuff you should still buy this book as a supplement to more technical books. If you seriously want to improve your video making skills then this is undoubtedly the best £5 you will ever spend. I really enjoyed this book. In fact I enjoyed it so much I read it from cover to cover. Short enough to let you do that, long enough to impart something useful… what makes this book the gem that is – a charming, personal, and informed account from a person who knows what he is talking about. Genuinely useful and totally engaging. With “Run ‘n Gun Videography: The Lone Shooter’s Survival Guide”, Joe Caneen will help countless numbers of solo videographers over come a crippling condition known as OECD (Obsessive Equipment Comparison Disorder). Before reading the book, I thought I was immune, but as I read chapter after chapter I saw myself as one of the many that thought I always needed more, faster, bigger. “If I only had the new PanaSonyCon X200-HV50Z with the f1.1 Zeissmika lens, I could shoot video just like………” That was my train of thought until Joe Caneen, in plain simple language showed me how to approach a shoot and not get lost in the technology, to stay focused on the target and to make the most of best equipment I had…myself. This book is an inspiration. This Should be a Required Tex for Video and Film Students!! …I found it especially refreshing that the author first provides the fundamental and core concepts about larger practices (Read Chapter 2 as a great example of this) and then builds on that: this is what we do in our literary studies classes, where we encourage our students to learn the basics first and after that performing complex tasks becomes easier. It seems Joe has given his audience a kind of how-to-book that explains, beyond technique, the how and why aspects of the craft of videography! A wake up call for the practicing video amateur.Joe shows you the kind of success you might aspire to if you can take pride in your productions and continue to learn your craft. He instructs you in how to raise the level of your own game.This book is another aid in becoming a pro. videos to date. I really appreciate his input and look forward to more books and videos by him. The best advice for solo videographers out there, buy it. A really great handbook for the ENG style videographer. Full of great sensible advice throughout and lots of useful tips. It confirmed many of the ideas I had developed and taught me a lot more. his experience of both film crews and working solo means he can pick the best bits from both and discard the more trendy and nonsensical bits the are sometimes bandied about. Great read for those of us entering in to the world of video. Helpful tips, thoughtful reminders of the mission – to communicate. Well done. The most inspiring video teacher I have found! …Good quality cameras are readily available now on nearly every budget level. But if you want to get beyond “point it that way and hit the red button” skill level, you need advice and insight. And The Video Whisperer is the best I’ve found. In part, I freely admit, because I just like him. His personality and easy communication style are very relaxing and familiar. And I find that with that relaxed feeling, my mind is much more receptive to the information being given. Note: I’ve uploaded over 180 videos to YouTube with no trouble and for unexplained reasons, this one was a nightmare. 3 aborted uploads. Finally made it as a 720p upload, but the color was quite red. Thought it was a fluke, but uploaded again with same results. Finally in desperation I altered the red in the edit by several points and did several test uploads until I got what you’re about to see. It’s still not as nice as the original edit which had absolutely no color correction, but I was getting fed up. Anyone else have trouble recently with Youtube uploads being altered in color by YouTube? (from the Run and Gun Videography Blog, published here as well for your info). 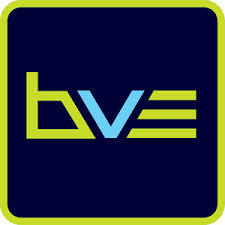 There are a few take-aways from the BVE Expo in London for the run and gunner. 1. My primary area of interest in attending was LED light technology because I figured that’s where the industry is heading. And I was right. Boy, they sure have made fantastic advances. Prices are still high but they will come down. The first thing I noticed is that they’ve been making the equivalent of 1K and 2K fresnel lamps (focusable point source lights). The run and gunner doesn’t really need anything that powerful, BUT–that means we’re no longer restricted to soft box lighting as the only practical means of lighting location shots. 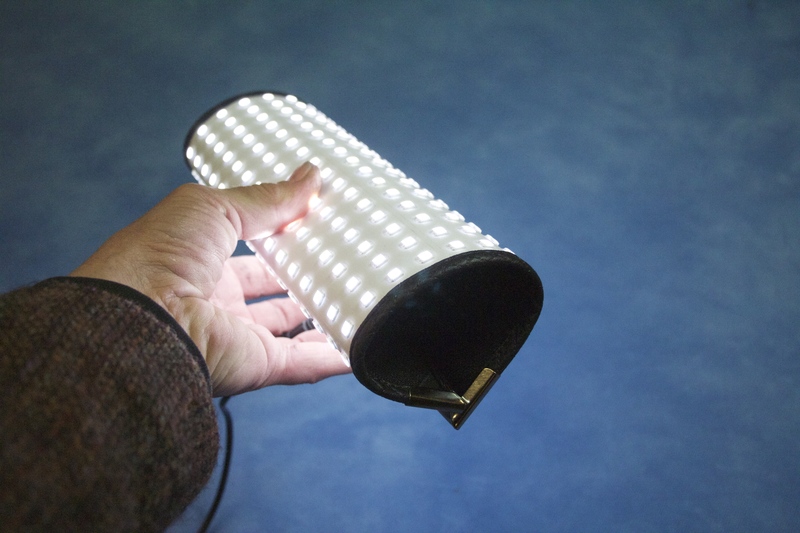 Fresnels are lenses on lamps that allow you to ‘spot’ and ‘flood’ a light. And, being a point source, you can also easily control (with barn doors or external flags and gobos) where the light hits. This is what Hollywood uses to light sets. 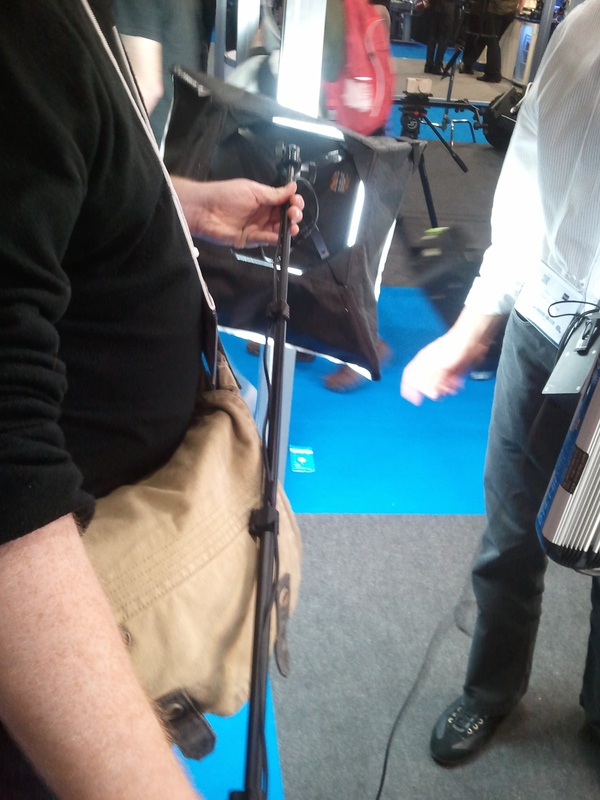 Anyway, they also had smaller point source LED lamps, but from what I saw, they dropped down to the 100 watt range. There were a lot of these tiny focusable LED lights complete with barn doors, but oddly I didn’t see anything in a mid-range equal to, say, a 500 watt tungsten lamp. While that was good news generally, that’s not what I was looking for. 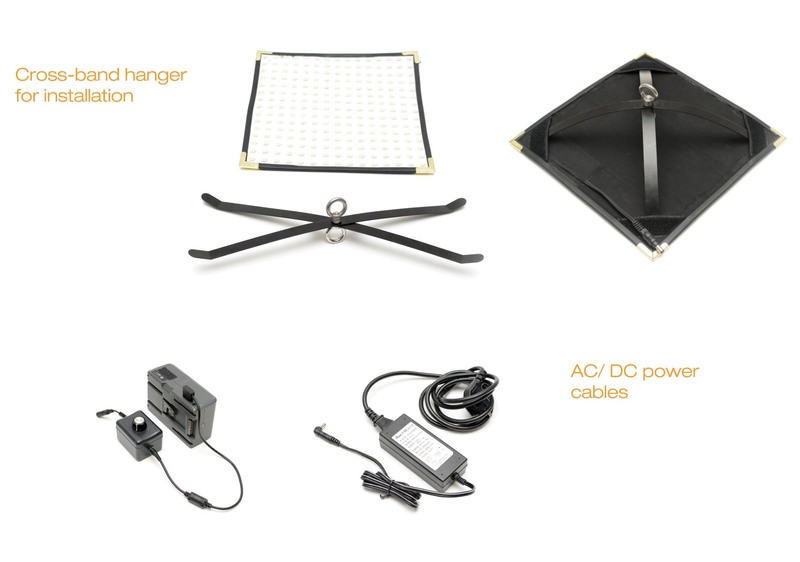 I was looking for a quality replacement for what I currently use which is flouro soft boxes which, with the biggest bulb, barely equate to a 300 watt tungsten halogen. And these are the things that most run and gunners are using. You really have to get them close to achieve any sort of modelling in a typical corporate shoot in a daylight lit room. There have been LED panels available for a few years that weren’t much better in term of luminance. And most came from China. This is the area that has seen fantastic improvement. There was a plethora of LED light panels of various sizes. And the main thing I noticed was that they were all amazingly BRIGHT. Furthermore, most companies provided a model that will give you both daylight and tungsten (interior) colour balance. But they’re still rather pricey. 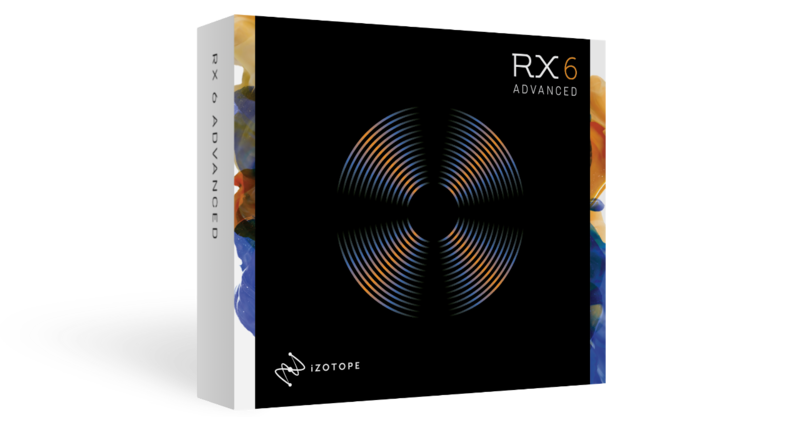 At least now, if you can afford them, they’ve got enough ‘umph’ to way outdo anything you can do with the current flourescent soft boxes. And they come with various filters that can either focus that output to a 30% area, or diffuse it further. And they’re dimmable, controllable from smartphones, and all sorts of fancy usable stuff like that. However, it wasn’t until I found one small booth that I got really excited. 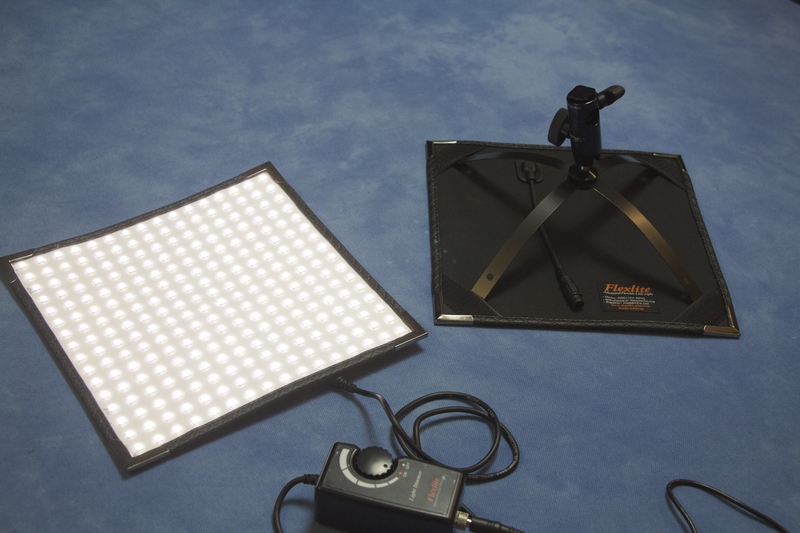 There were half a dozen or more companies offering some very attractive and high quality LED panels ranging from about £400 to almost £1000. I’m talking small panels such as a run and gunner would use for interviews. The high-end expensive ones were worth it for what they could do. But still, that’s a lot of money. The one thing common to ALL of them was that they came in metal housings with barn doors and slots for filters, jacks for batteries, and control panels on the back. I wasn’t expecting anything else…. Until I found this small booth. 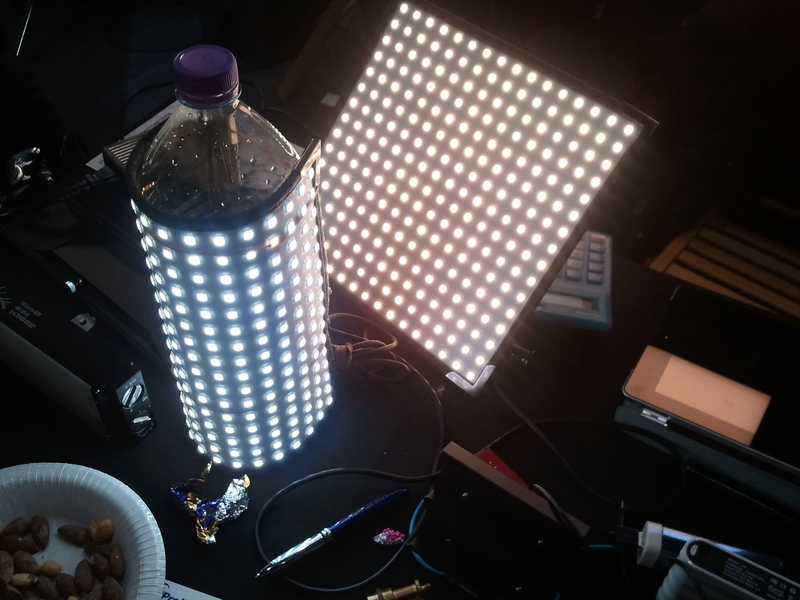 What caught my attention was an LED panel wrapped around a 1 liter water bottle sitting on a desk. I noticed it while talking to an American that was responsible for a very high quality German design which I quite liked (but which was a tad expensive). Turns out that panel wrapped around the water bottle was the product sold by an outfit called Pro Light Direct (who also distributes the German design I mentioned). That little LED panel is probably what is behind most of the other LED panel designs. I mean, if you looked inside of their fancy aluminum casings, essentially what you’d find is what this guy was selling without the fancy box. And it was flexible. 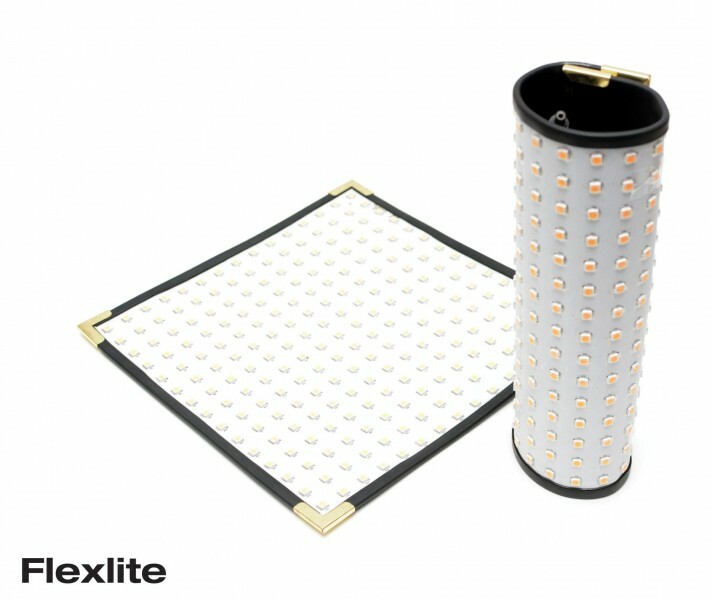 Currently available in either 56K or 32K dimmable units. Bi-coloured versions coming soon. 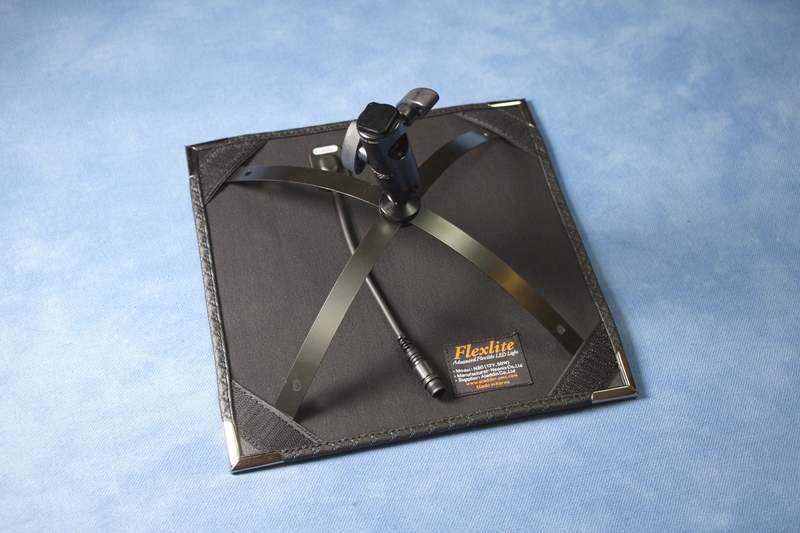 So here was this amazingly bright LED panel on a flexible backing that could be velcroed to a wall, a ceiling, a car windshield…, or put in the very simple aluminum frame provided so that it could be put on any light stand or clamp. I asked if it was durable. To answer that he threw it down on the ground, still lit. Yeah, it’s durable. At the show he had a softbox (which was a prototype, not yet available) that could be affixed to the supporting frame . 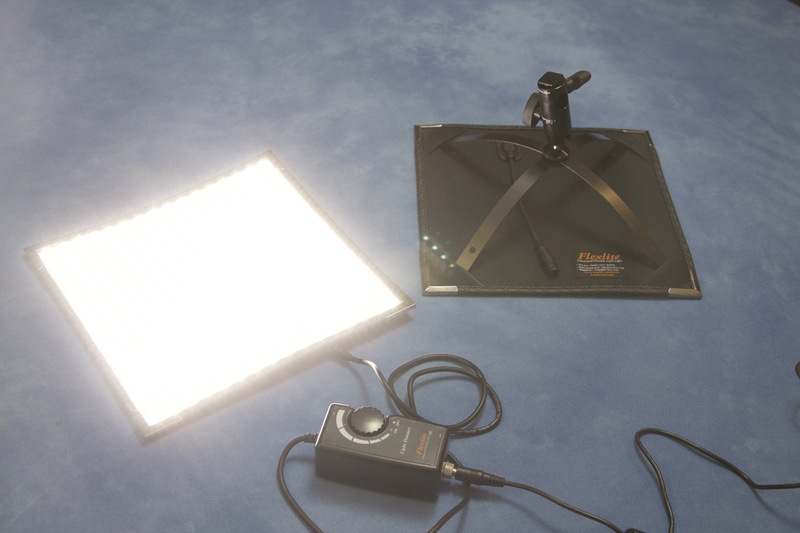 LED panel in it’s supporting aluminum frame attached to its softbox with velcro. But the whole thing was feather weight and would take up practically no room in your light case. It’s currently only available in 56K panel or a 32K panel, but he says they’ll soon have a bi-colour version of the same. THIS is the one you want! It’s still about £400 or so with its controller (I forget the exact price), but of everything I saw, this is the one that got me excited. Furthermore, unlike the cheap Chinese ones you can get on eBay, this one is close too 100% accurate on colour temperature (as most of these products that I saw at the show were). And, it’s really BRIGHT! The other thing that was prominent was stabilising equipment for DSLRs. I saw guys suited up in some stuff that looked more gruesome than a Steadicam wobbling around like Frankenstein with a DSLR attached, not to mention other DSLR set-ups that looked like they might cost as much as an Apollo mission. I can do better than what they can do with all that with my Sony PXW X70. Oh, and Sony announced a couple days ago that the 4K upgrade will be available for the X70 in around June 2015. I think there’s an upgrade you can get right now that deals with a few things like improve facial recognition. Also heard from Sony that Apple may have an XAVC plug-in in a couple of months. At any rate, they say it’s in Apple’s hands now, as Sony has given them all they need to be able to do it. 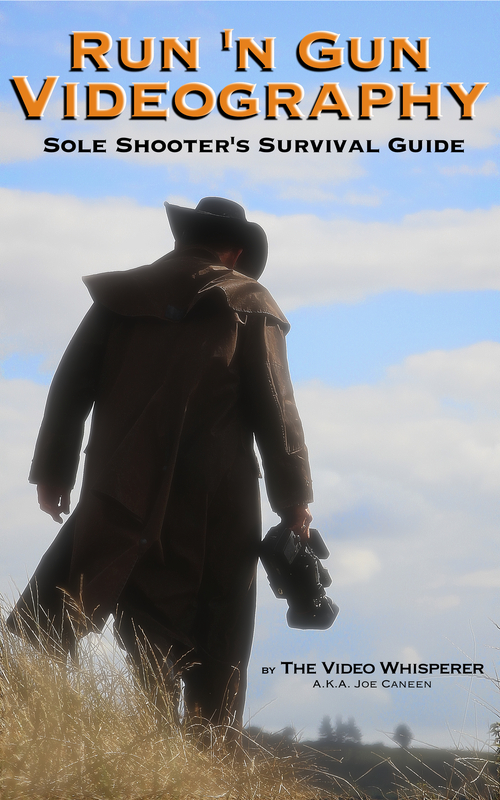 In my ebook Run ‘n Gun Videography–The Lone Shooter’s Survival Guide, I discussed the merits of soft bags versus hard bags and specifically my case of choice from Lightware in the U.S. In short, hard cases (such as Pelikan and Anvil) with hard foam cut-outs for your equipment still transfer all the shock directly to your equipment if you were to drop the case. They’re also heavier. 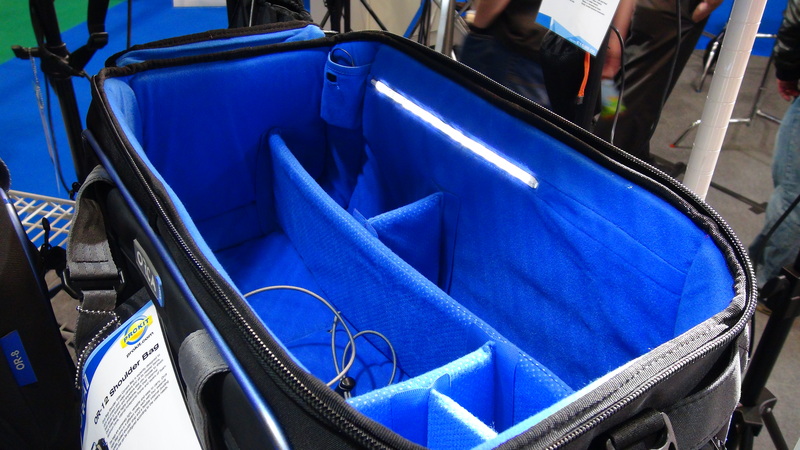 Lightware cases are built around tough Lexan (the perspex that aircraft windows are made of) boxes padded with foam and encased in a very tough fabric with moveable velcro dividers inside. You could throw it off a moving truck and your gear would be safe because the case gives slightly and absorbs the shock without collapsing while your equipment just jostles around within the padded partitions. Made in Israel, this bag was an instant hit for me. It probably isn’t as tough as a Lightware case, but is built on the same principle. For those who don’t make a habit of throwing their stuff out of moving vehicles (it would probably survive that too though it might get scuffed up more) it’s a fantastic line of cases. Plus, as you can see in the photo, they have a cool LED strip that lights up the inside of the case. If you’ve ever been backstage during show-time looking for a spare battery or something, you’ll know how brilliant that is. Well, I had to title it that way so you know it’s me. The Sony HXR NX30 review (Pure Frickin’ Magic) got 80,000 views between its two parts at this writing and became the top search result for that camera within a few months of it’s upload and has been ever since. Thanks to all of you who watched it, commented and shared. This PXW X70 review is a bit long (24 minutes-yikes!). I hope it’s worth your time. Many have asked if the stabilisation is as good as the NX30’s. In this review you’ll find a side by side comparison with both cameras on the same mount during long, sustained walking shots both from behind and from in front of the subject. The answer to that question will be obvious. This is a 1″ sensor camera with a fixed lens. It’s ‘4K ready’ meaning Sony plans to release a future firmware upgrade (for a fee). It’s slightly bigger and heavier than the NX30, but is still a small camera, perfect for run and gunners. You will get nicer interview shots in terms of depth of field, but it won’t be as nice as some of the more expensive 1″ sensor cameras with interchangeable fast lenses or DSLRs. You’ll see samples of what your interview shots can look like in the review. Personally I haven’t bought into the whole ‘cinematic’ look as being a vital commodity in corporate video production. Whether ‘cinematic’ or otherwise, if a video producer gets the message across with clarity and impact resulting in increased name recognition or sales or whatever the objective is, he’s done his job and the client is happy. Technical rendition will never trump message and too many people are so into their technical rendition that they forget the main reason they’re producing a video in the first place. That said, for those pros who innately apply that principle (and many do), nothing wrong with ‘cinematic’. This camera is ideal for the lone shooter for its size, ease of operation, intelligent auto systems, stabilisation, and now, more of an edge on shallow depth of field than smaller sensor cameras in this class. Not to mention its price at £1800/well under $2500. Due to it’s larger size, it’s got a lot more easy access buttons for various aspects of manual control. The menu is easy to access and is loaded with features. It can shoot in AVCHD mode like the NX30, but also in XAVCHD which takes full advantage of the full HD information. It’s a format designed to handle 4K. With shooting modes capable of 50mbps, the camera qualifies for broadcast quality. I can’t speak for the BBC, but I’ve already gotten a green light from another national station that may use some of my footage for a program being done on Belvoir Castle on which estate I live. But as with the NX30, the reason I bought this camera is for the corporate videos I do as a lone shooter. As I talk about in the ebook ‘Run ‘n Gun Videography–the Sole Shooters Survival Guide’, I like to travel light and fast. Where some walk into a corporate video loaded down with a truck load of armaments, I walk in with a 6 shooter and get the job done. A friend recently told me you have to impress them with your fancy cameras. In his case he brings along the fancy cameras along with his small ones. In the end, it’s the small ones that get used in his edits. Why go through all the trouble? I’ve never once had anyone comment on the size of my camera. No, I take that back…when I used to travel with the big ones, I got a lot more trouble from security and police. But that’s because I was alone and didn’t have an organisation working ahead to clear everything. And when you’re alone, you need a camera that’s ‘got your back’. It was uploaded in full 1080 HD, so be sure to select that in the YouTube drop down menu for best evaluation of the footage. The second video below is simply a 2 minute excerpt of the first one and features the side by side comparison of the X70 to the NX30 in Active Mode stabilisation. The third video there is Sony’s promo for the camera mentioned in my review. The detail shots of the artisan glass truly showcase the image quality the camera is capable of. 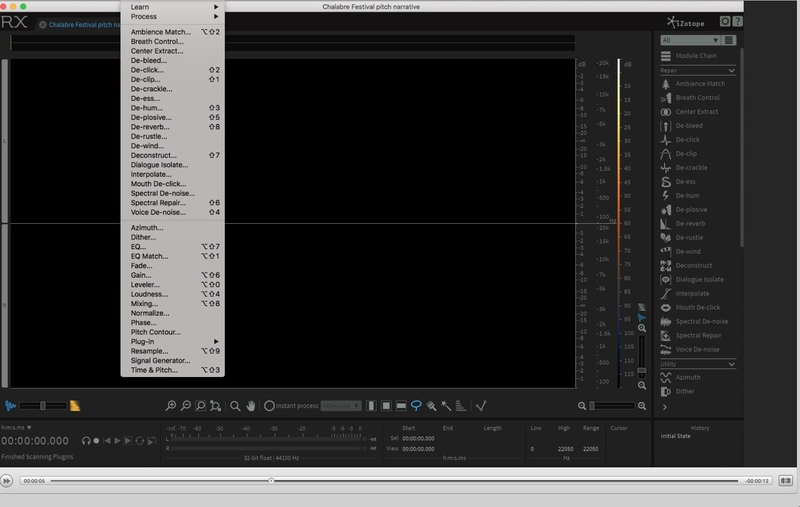 There are a few of points where the audio dropped low and/or I forgot to add a filter to a bit I added. Unfortunately it was late and I didn’t catch it before the 22 hour upload, so sorry about that! When I bought the NX30 I bought it from Jigsaw24.com out of Nottingham. I was so impressed with their courteous and helpful prompt replies to emails and lightning fast delivery (paid one afternoon and it was on my doorstep next morning), I added a link on the blog. I did note that many people clicked on it but have no idea if any sales resulted. This time I contacted the Sales Manager Andy Crawford and asked him if were to do mention it on the blog again if he would offer any incentive. He said he would. How much, I don’t know. But these guys were so upbeat, knowledgable and service oriented, when I bought the X70 I didn’t even shop for prices. I just went back to Jigsaw 24, bought it, and received it next day again. Check out their site for all they have to offer in professional video and audio equipment (and more). And finally, a small advert, if you’re interested in hiring Ania for fashion, glamour, catalogue or advertising, go here.